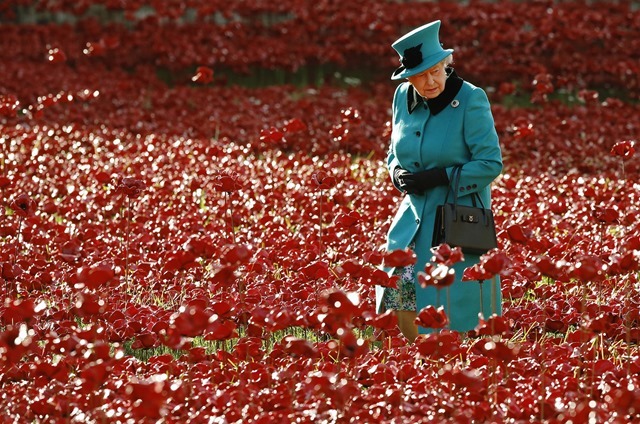 Home › Current Affairs › Top 82 Powerful News Images of 2014. 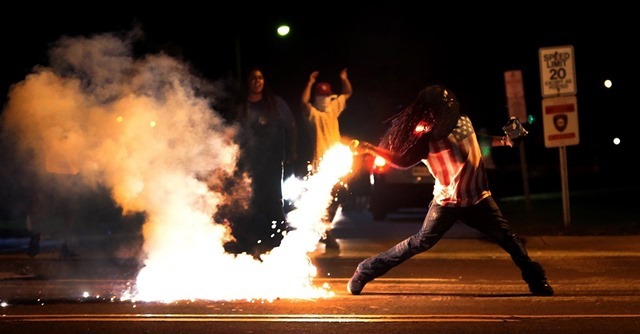 Top 82 Powerful News Images of 2014. 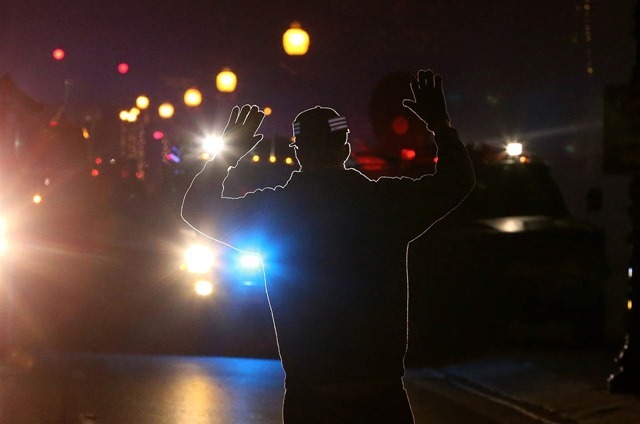 I watch the news each day and write a daily summary of the news called the Morning News Wrap: following is my selection of the best images of news stories for 2014. 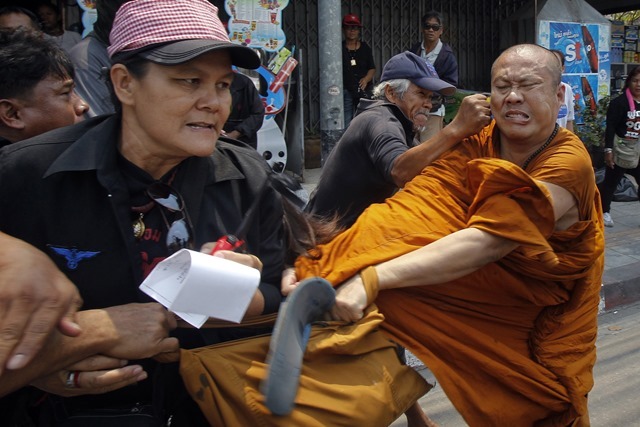 This is not meant to be an exhaustive summation of all the major stories….just the images that I think really tell the story. This view was captured as the Philae Lander approached the surface of comet. 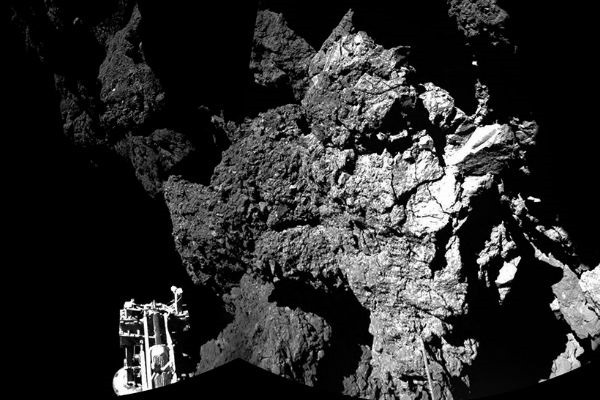 This made history as the first landing of a robotic spacecraft on a comet. The Rosetta mission cost close to £1.1 billion and took 10 years. The landing took place 316 million miles away from Earth and the time it took to send news of the landing back to the home planet was 28 minutes, 20 seconds. 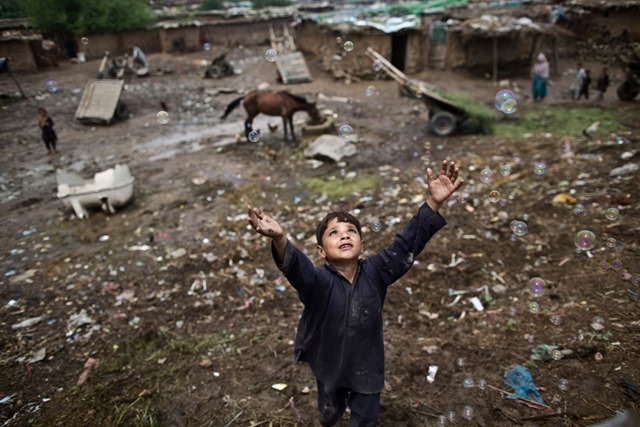 An Afghan refugee child chases bubbles released by other children, while playing on the outskirts of Islamabad, Pakistan. Rescue workers climb to an ash-covered shrine near the summit of Mt. 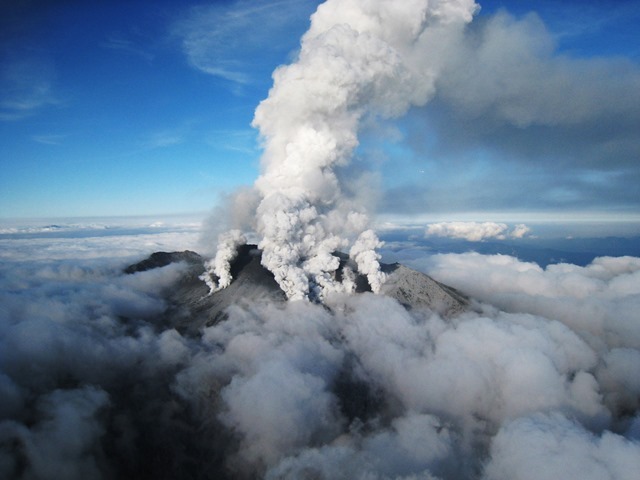 Ontake, Japan, which erupted and killed 56 people. 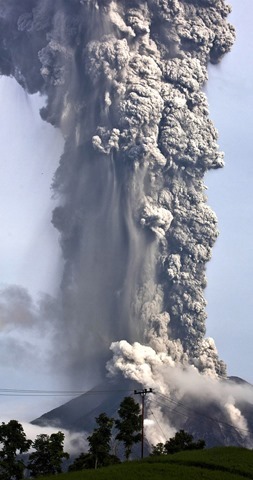 Mount Sinabung spews a column of hot gas and ash skyward, as seen from Tigapancur village in Karo district, on November 14, 2013. 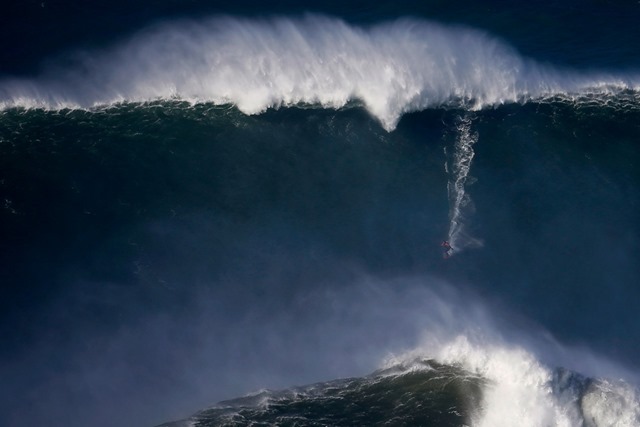 A surfer drops in on a large wave at Praia do Norte, in Nazare, Portugal. 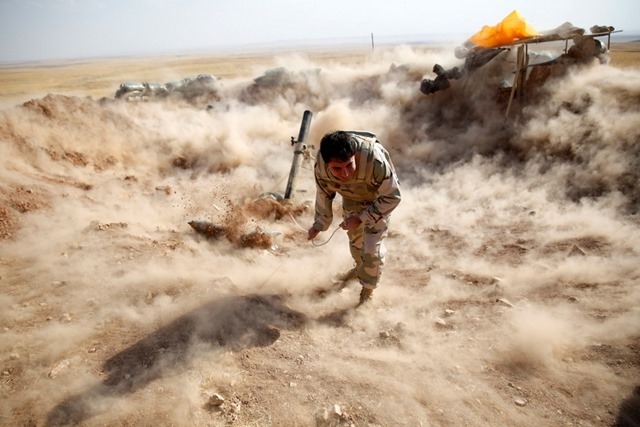 A Kurdish Peshmerga fighter launches mortar shells towards Zummar, controlled by Islamic State (IS), near Mosul, Iraq. 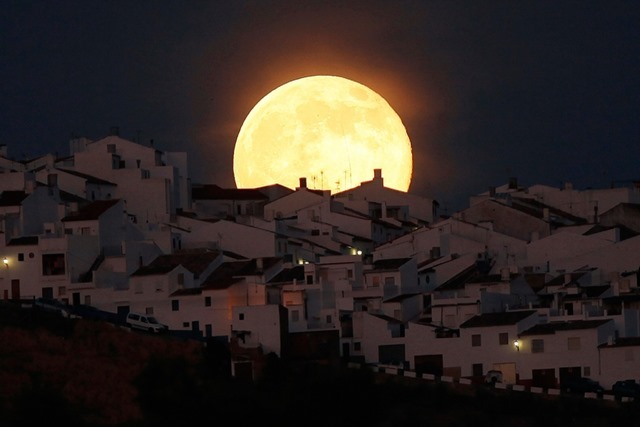 The Supermoon rises over houses in Olvera, in the southern Spanish province of Cadiz. 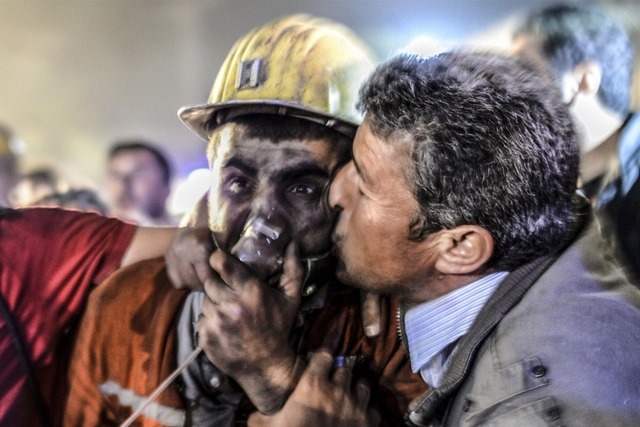 A man kisses his son, rescued after an explosion in a coal mine in Manisa. At least 157 miners were killed in collapsed coal mine in the western Turkish city after an electric fault. 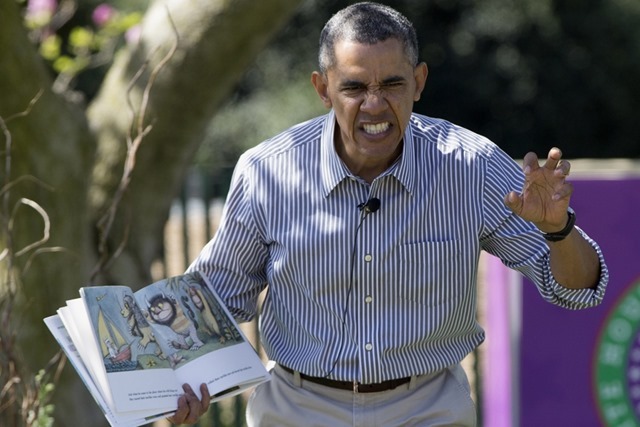 President Barack Obama makes a face as he reads the book “Where the Wild Things Are” by Maurice Sendak during the White House Easter Egg Roll on the South Lawn of the White House is Washington. 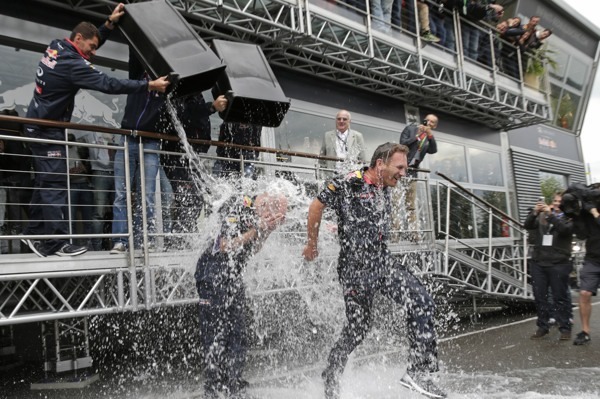 Red Bull team members throw buckets of ice water on Technical Chief Adrian Newey and Team Chief Christian Horner at the Spa-Francorchamps circuit in Belgium for the Ice Bucket Challenge which supports the ALS Association in raising funds to cure Lou Gehrig’s Disease. Over 3 million people donated and helped raise in excess of $100million which proved the true power of social media when it comes to fundraising. 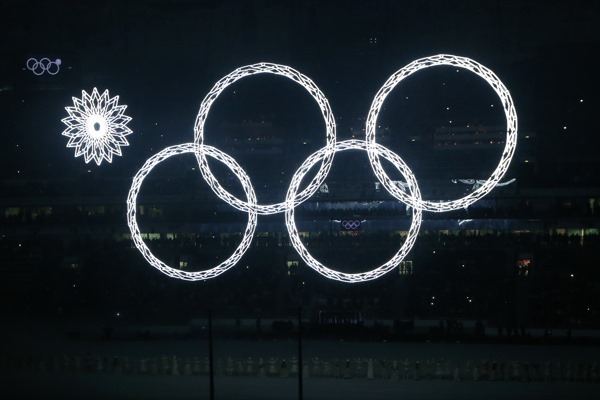 During the Sochi opening ceremonies a huge malfunction took place when the five giant animatronic snowflakes, which were intended to transform into a complete set of glowing Olympic rings, only became four. 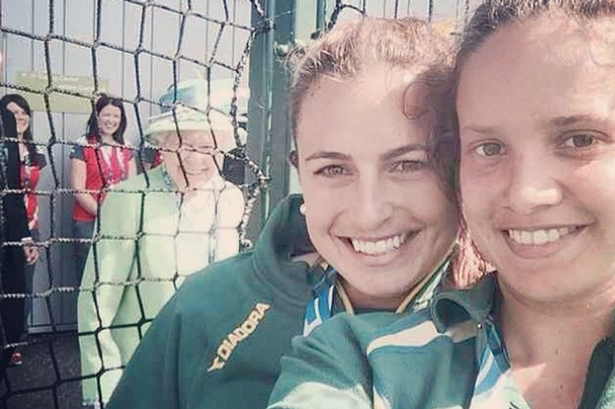 Although Russia did poke fun at itself when the closing ceremony showed performers re-creating the giant set of Olympic rings – but deliberately left one ring closed small to remind the world that they really do have a sense of humour. Starlings are highly social birds who flock in varying sizes throughout the year. A flock of starlings is called a murmuration and have been photographed in some truly astonishing patterns. 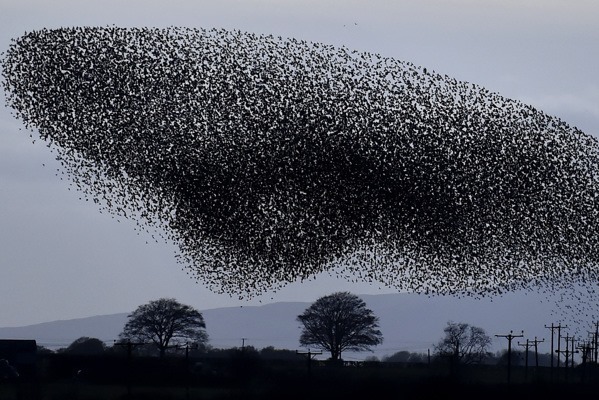 These flocks may include several types of starling and different families and have been known to flock in formations such as this in their thousands. 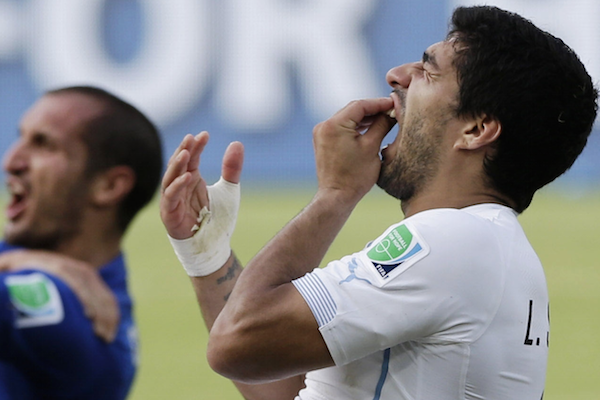 At the 2014 World Cup, Uruguay striker Luis Suarez was suspended from the game for four months after biting Italy defender Giorgio Chiellini on the shoulder. This was the third time Suarez had attacked a player on the pitch in such a manner and it overshadowed pretty much the whole tournament. 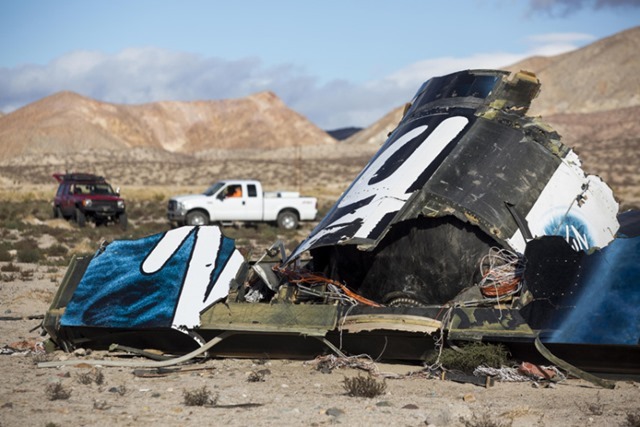 The remains of a Virgin Atlantic Spaceship that crashed. The crash claimed 2 lives. 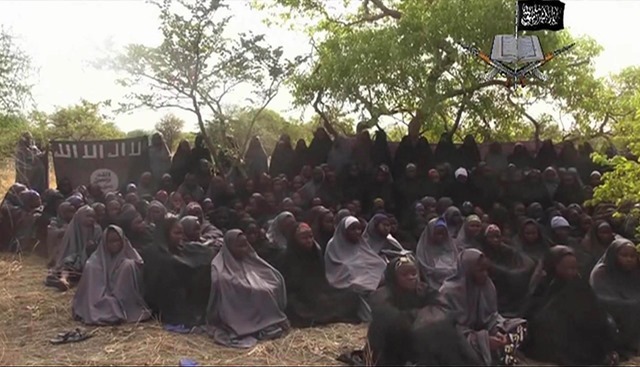 This is a still of the Kidnapped girls from Chibok. 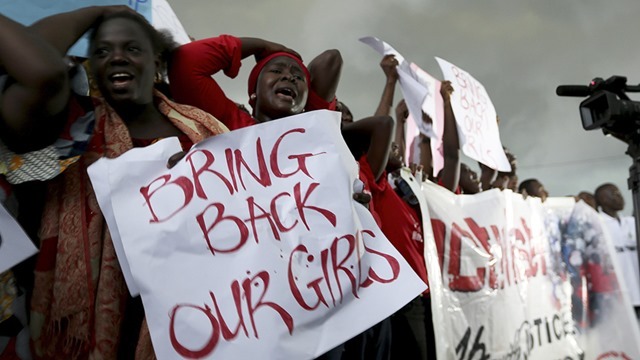 The video was put out by Boko Haram. 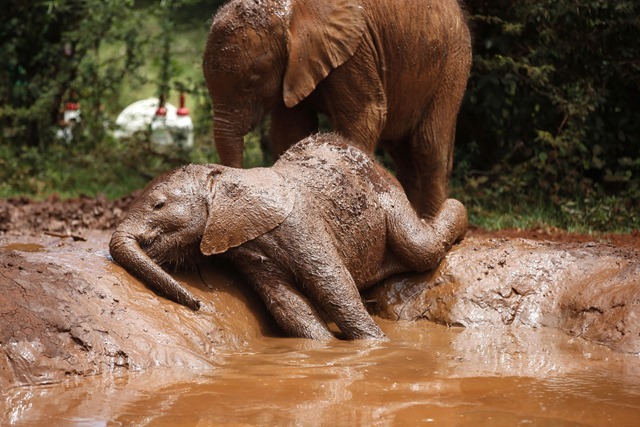 The girls have still not been found. 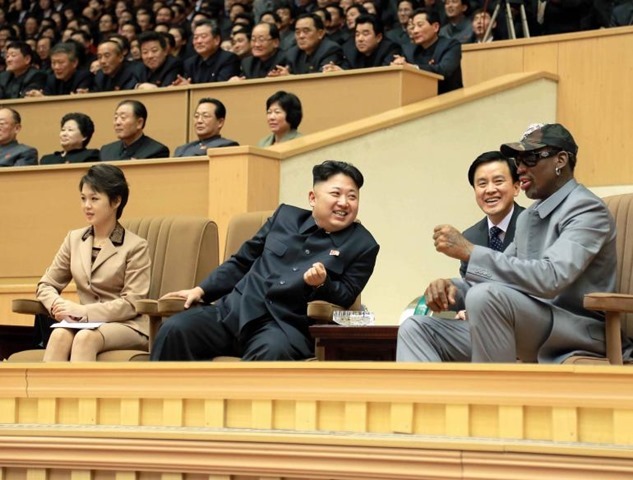 NBA player Dennis Rodman took a few trips to North Korea. 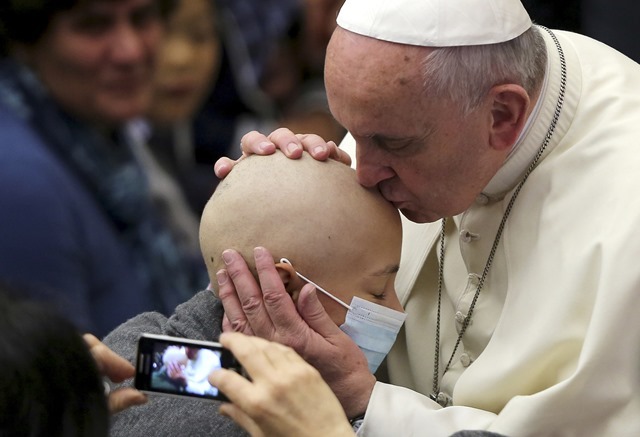 His visits were highly criticized worldwide. 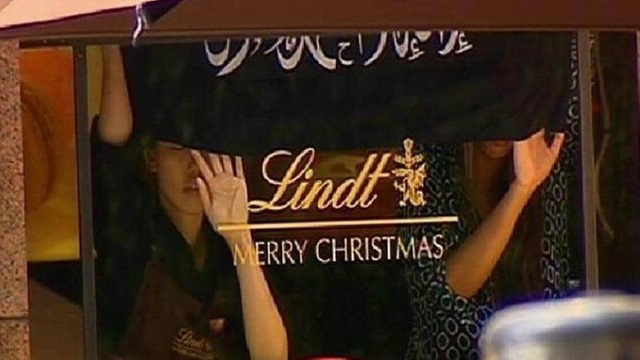 Gunman Man Haron Monis stormed a Lindt cafe in Sydney’s financial district in December 2014, seizing dozens of hostages. 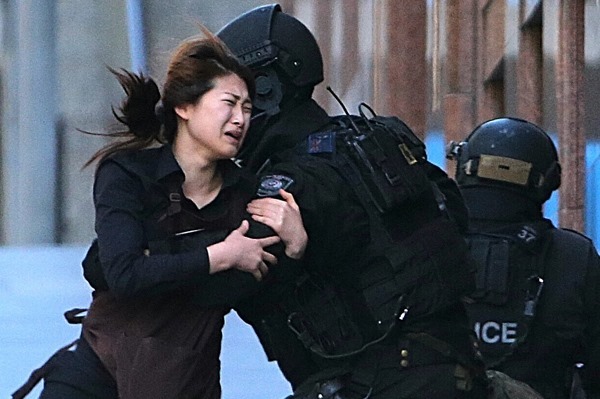 This image captured the tense moment when one hostage escaped the cafe through a back fire door towards the safety of the police, her expression a mixture of panic and relief. 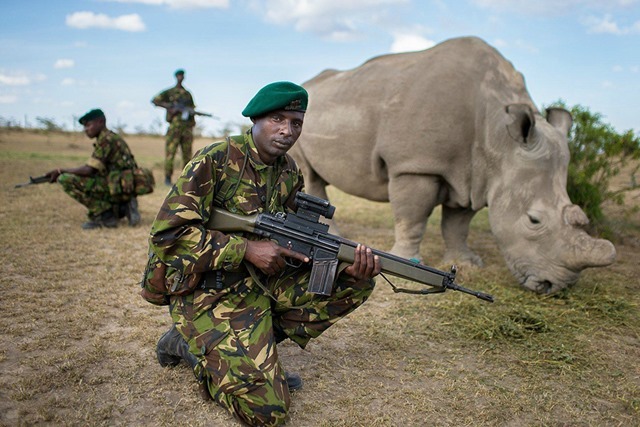 Bodyguards protect one of six remaining Northern White Rhinos. 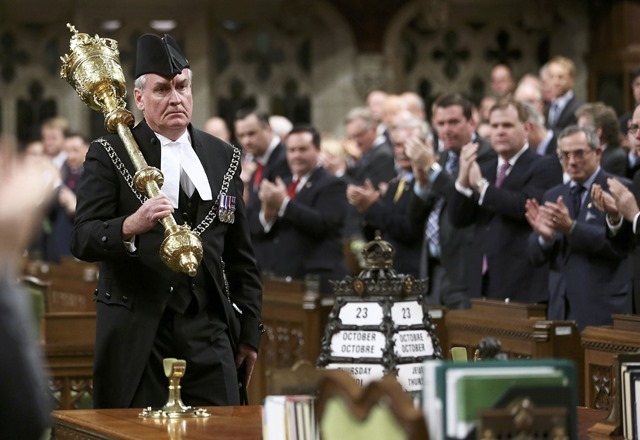 Kevin Vickers, the Sergeant-at-Arms who shot a gunman as he rampaged through the Canadian parliament in Ottawa , received a two-minute standing ovation as he made an emotional return to the House of Commons. 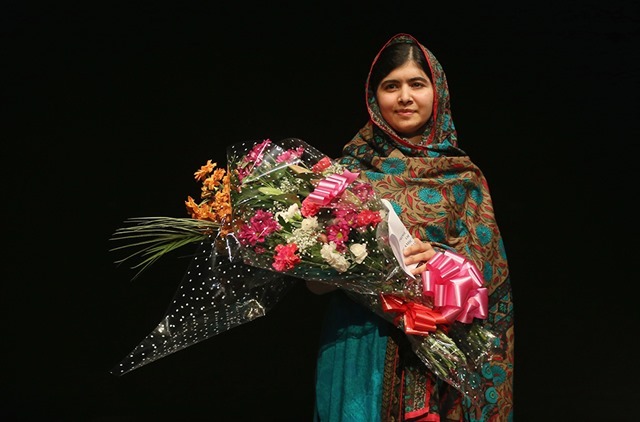 Malala Yousafzai won the Nobel Peace Prize. The 17-year-old from Afghanistan continues to campaign at the UN against violence, poverty and advocating for more access to education for women and girls despite nearly being shot in the head by a Taliban hit squad. 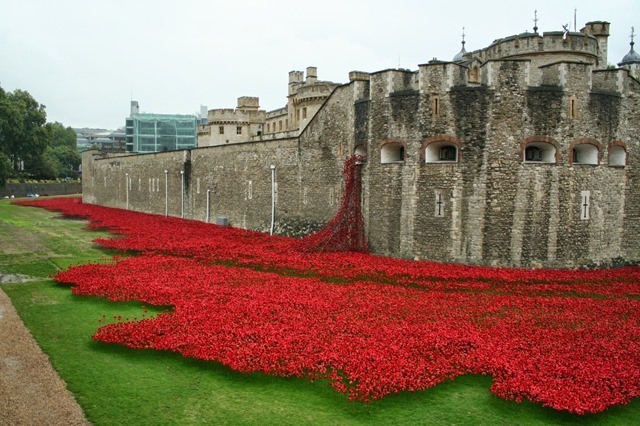 888,246 ceramic poppies flow from the Tower of London to remember the British soldiers that died 100 years on from the beginning of World War One. 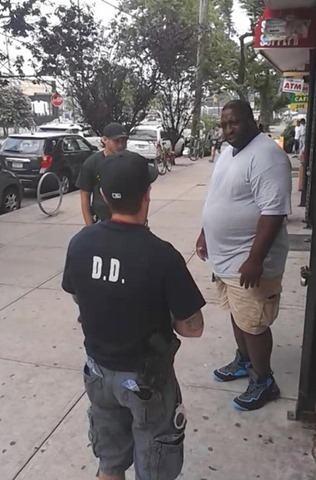 Moments before 43-year-old Eric Garner died while being placed under arrest for allegedly selling loose cigarettes. 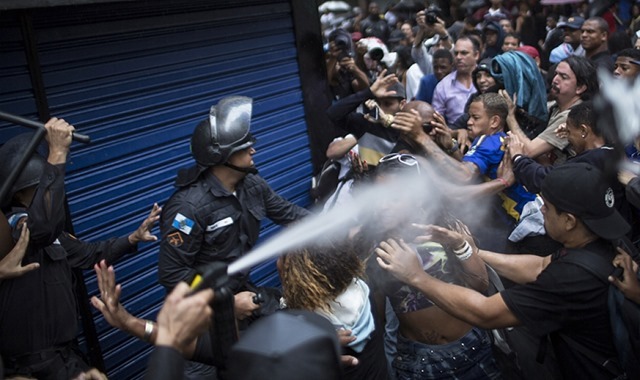 A cell phone recording captured the asthmatic father of six repeatedly saying ‘I can’t breathe!’ while being placed in a chokehold. 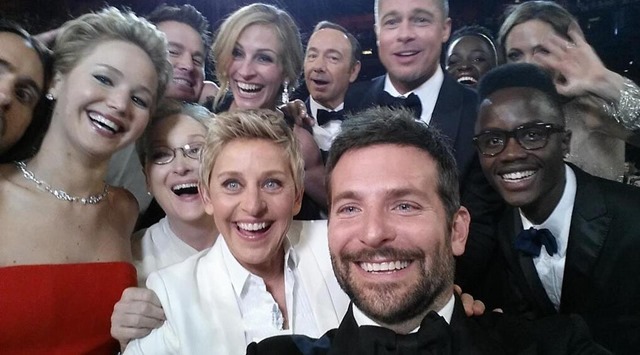 Ellen DeGeneres choreographed a star-studded selfie at the Academy Awards. 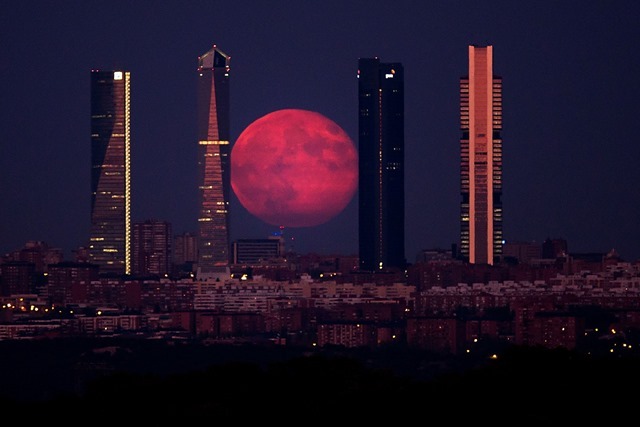 The image exceeded 1 million retweets in the first hour; today, that number is at more than 3.36 million, making it the most retweeted picture in history. 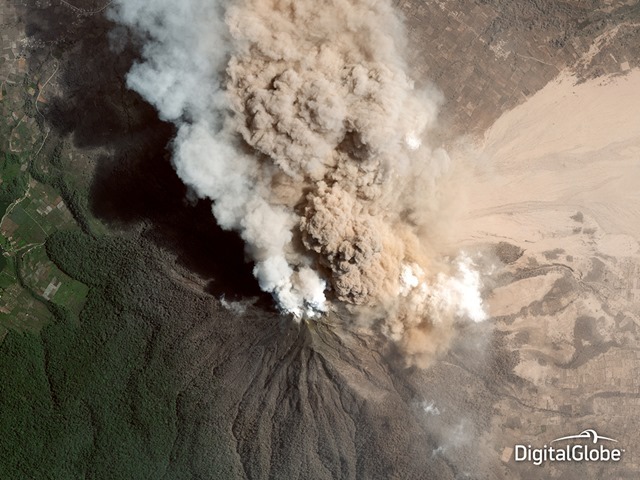 The eruption of Mount Sinabung, in North Sumatra, Indonesia, was a thing of beauty, but also of death. 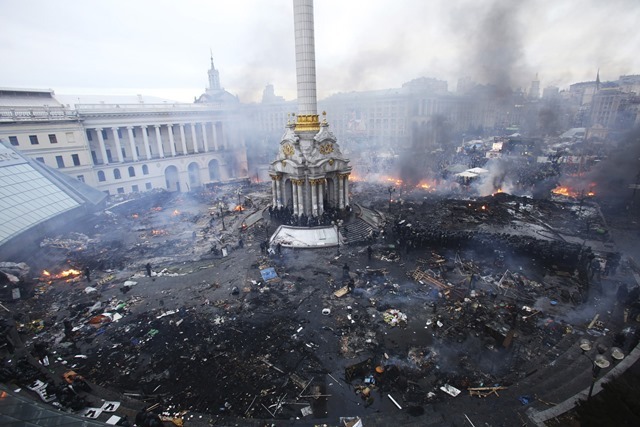 More than a dozen people were killed as it spewed ash columns more than a mile high. 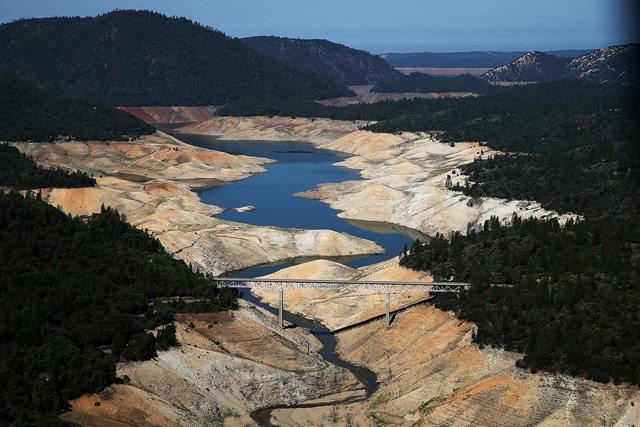 California continues to suffer from the worst drought in a millennium. These images are of the same reservoir in 2011 and 2014. 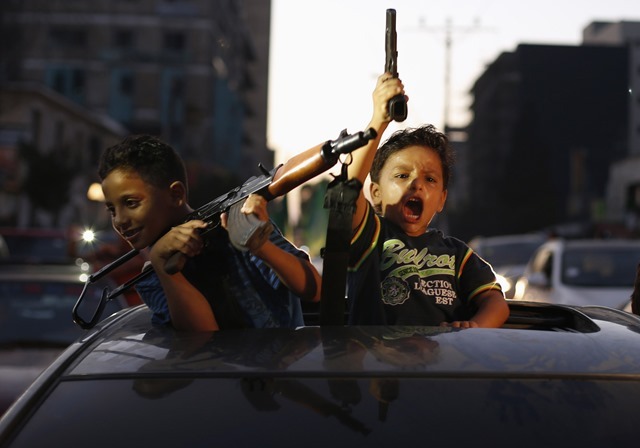 Palestinian children hold guns as they celebrate with others what they said was a victory over Israel, following a ceasefire in Gaza City, Aug. 26. 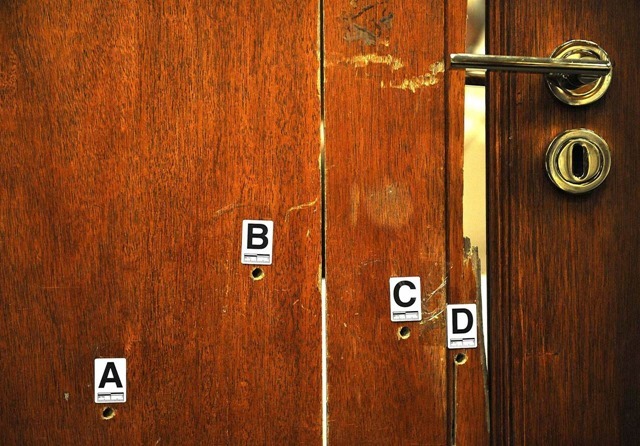 The bathroom door through which Reeva Steenkamp was shot is displayed during Oscar Pistorius’s murder trial in Pretoria, South Africa on April 14. 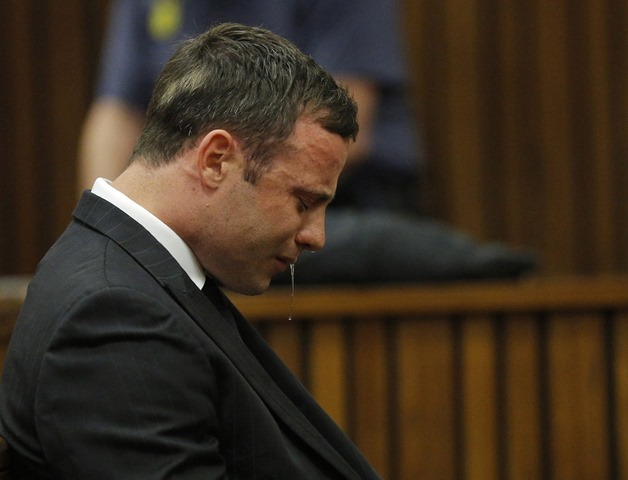 The double-amputee Olympic runner was given a five-year prison sentence by Judge Thokozile Masipa for shooting Steenkamp multiple times through a toilet cubicle door in his home. 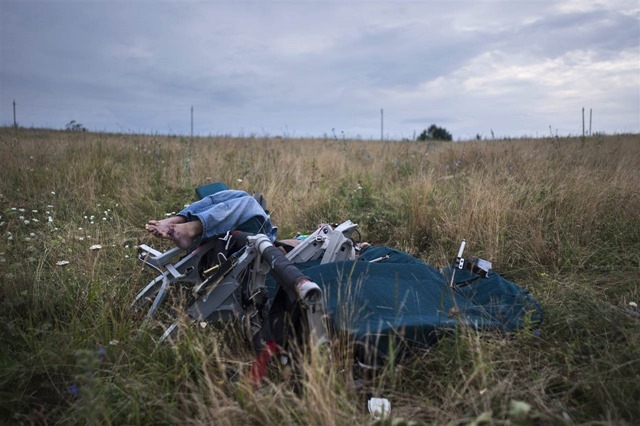 A body sits in a plane seat at the crash site of a Malaysia Airlines jet near the village of Hrabove, eastern Ukraine, July 19. 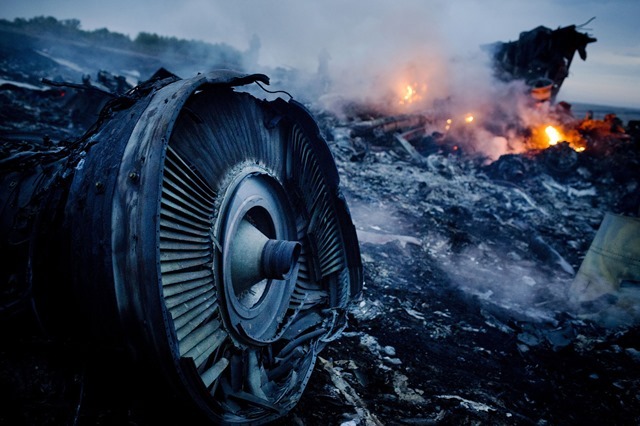 Flight MH17 was shot down over Ukrainian airspace killing everyone on board, including many of the world’s leading AIDS researchers. 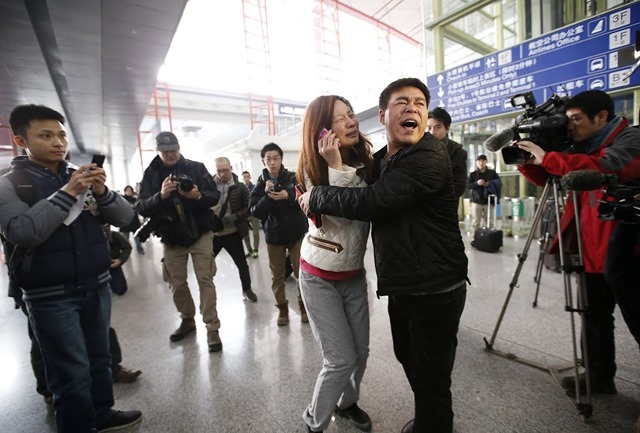 Malaysia Airlines Flight 370’s disappearance was one of the biggest stories this year. 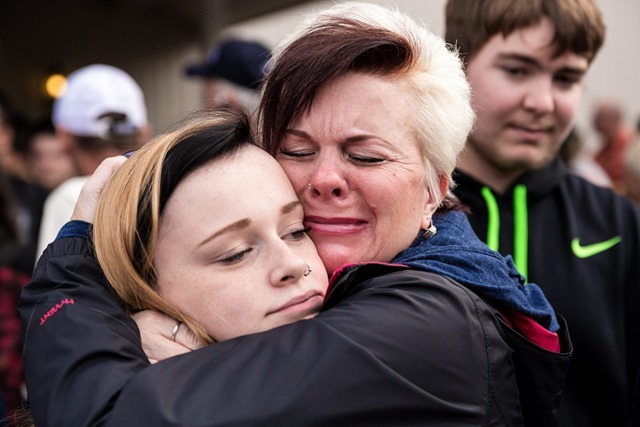 This picture shows a relative of one of the passengers crying because of the tragic news. 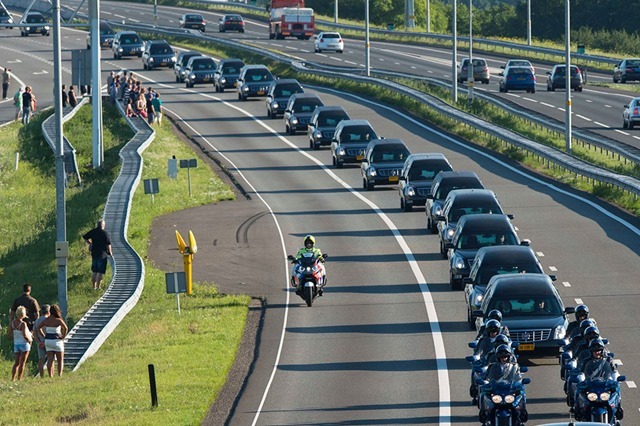 A convoy of hearses in the Netherlands carries the unidentified bodies of some of the 298 people who died when flight MH17 was shot down over Ukraine. 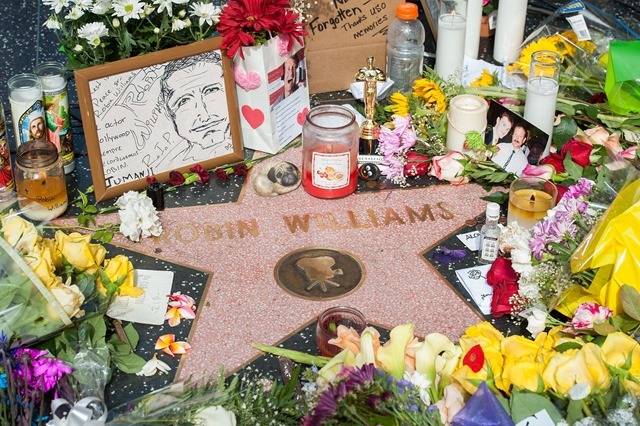 The world was sad when Robin Williams took his life. 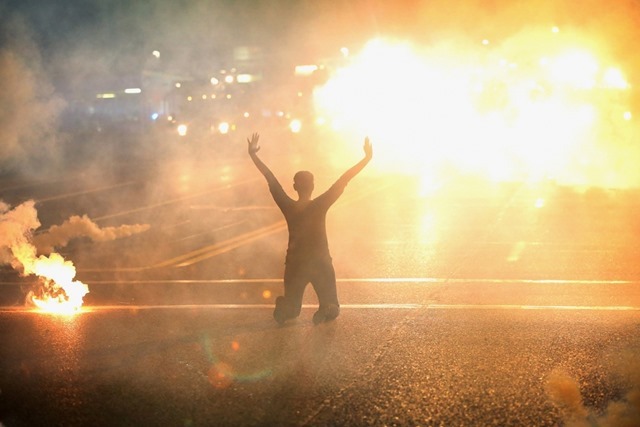 Tear gas reigns down on a woman kneeling in the street with her hands in the air after a demonstration over the killing of teenager Michael Brown by a Ferguson police officer in Ferguson, Mo. 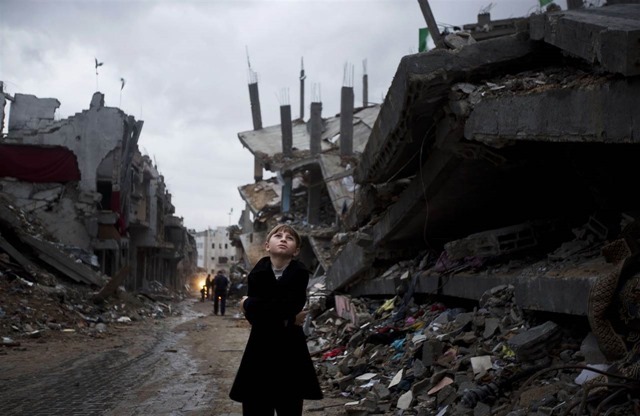 A Palestinian boy looks up during a rain storm in Gaza City on Oct. 19 while walking through a neighbourhood destroyed during the 50-day conflict between Israel and Hamas. 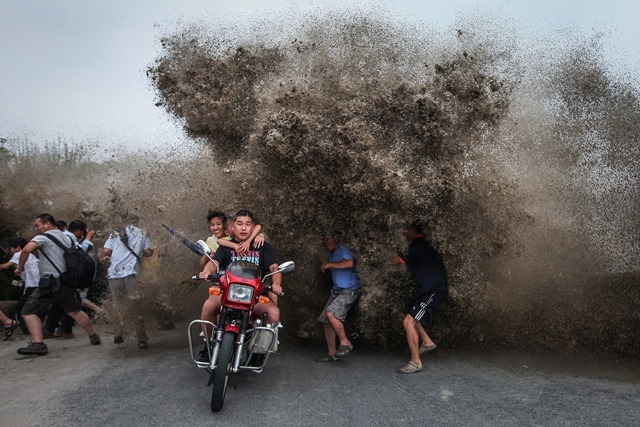 A massive mudslide swept a wall of debris through a small riverside neighborhood near Arlington, Wash., on March 22. 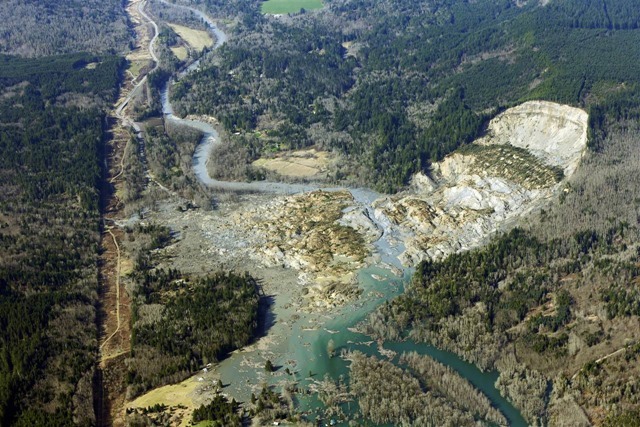 The 1-square-mile mudslide killed 43 people and destroyed about 30 homes. 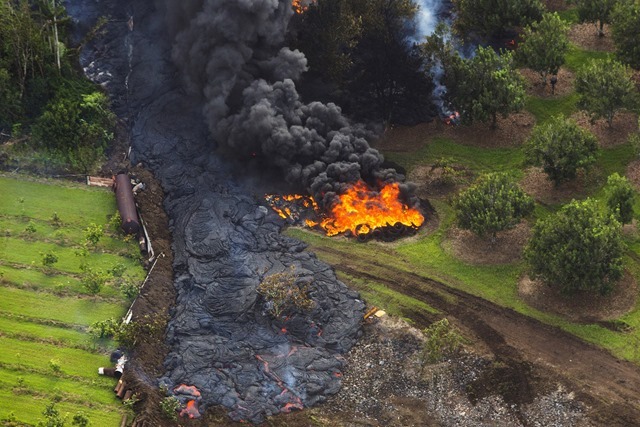 Authorities believe the slide was caused by ground made unstable by recent heavy rainfall. 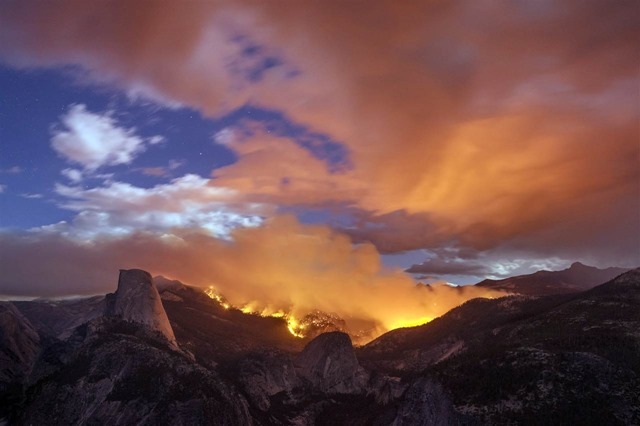 A wildfire burns next to Half Dome in Yosemite National Park, Calif. on Sept. 7. 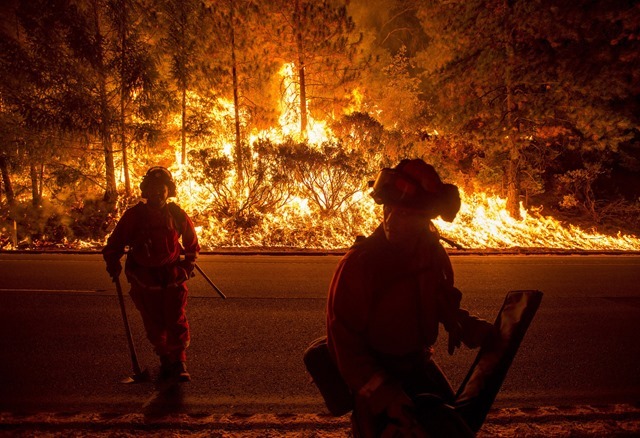 About 120 firefighters and 11 aircraft fought the blaze, which may have erupted from embers of a fire sparked by lightning several weeks earlier, officials said. 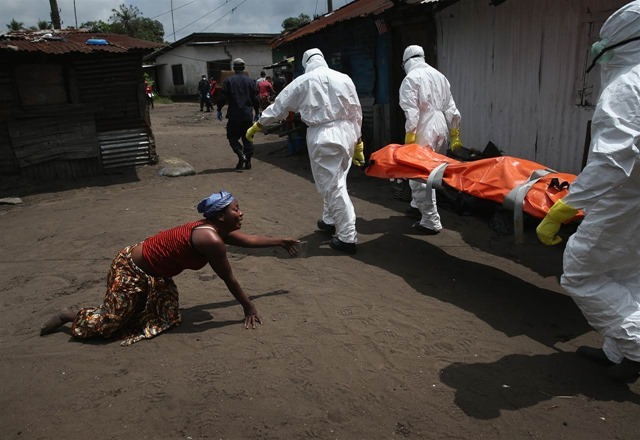 Ebola burial team members take away the body of Mekie Nagbe, 28, for cremation on Oct. 10 in Monrovia, Liberia, as her sister crawls towards her. 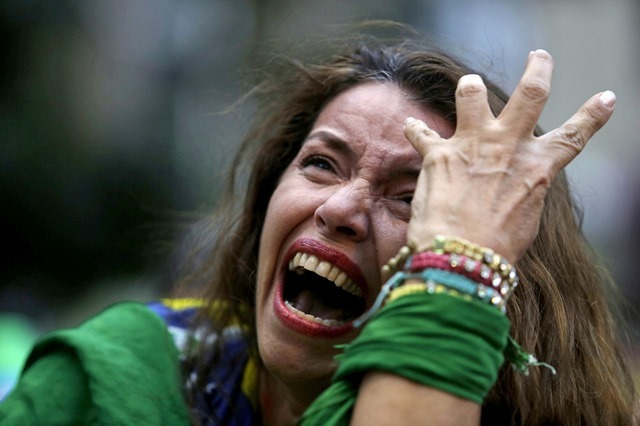 Nagbe, a market vendor, collapsed and died outside her home on her way to a treatment center earlier in the morning, according to her relatives. 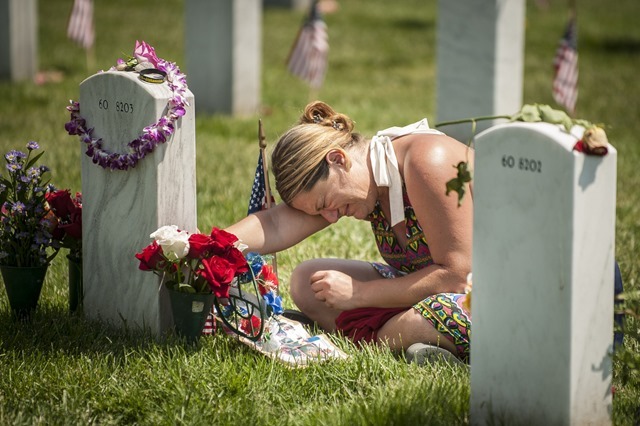 The burial of loved ones is an important tradition in Liberian culture, making the removal of infected bodies for cremation all the more traumatic for surviving family members. More than 18,100 people have been infected with Ebola and more than 6,500 have died in West Africa since the initial case in Guinea a year ago, in an area bordering Sierra Leone and Liberia. 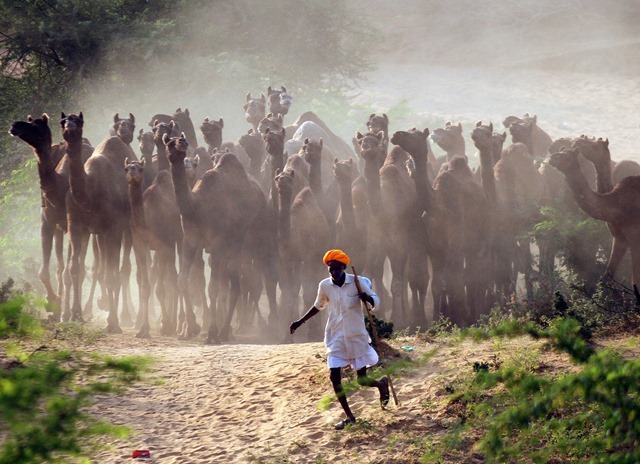 Unlike previous Ebola outbreaks, which had been confined to faraway villages in the rain forests of Central Africa, this one quickly spread to capital cities in all three West African nations and has become the worst in history. 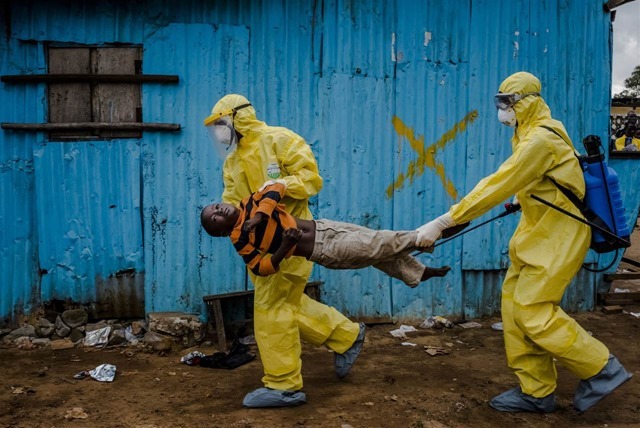 Medical staff carry James Dorbor, 8, suspected of having Ebola, into a treatment facility in Monrovia, Liberia, on Sept. 5. 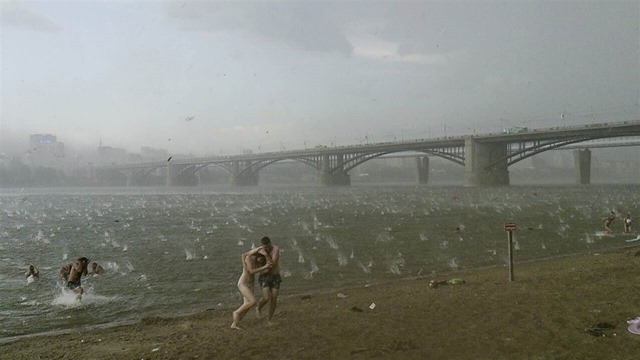 People run for shelter during a hailstorm on the beach at Ob River in the Siberian city of Novosibirsk, Russia, on July 12. 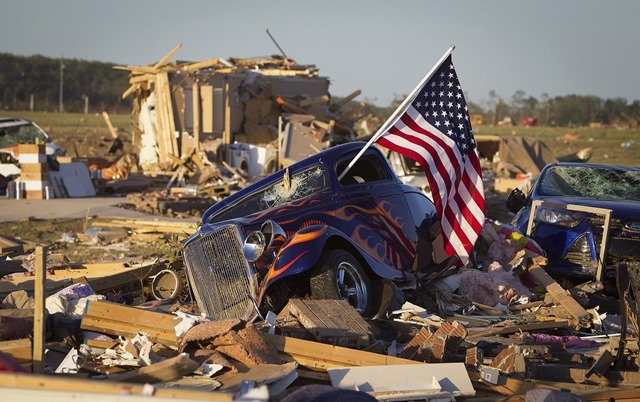 The storm sadly proved fatal as it took the lives of two young girls who suffered traumatic brain injuries when a tree fell on the tent they were taking shelter in. Odell Beckham of the New York Giants scores a one-handed touchdown in the second quarter against the Dallas Cowboys aon Nov. 23, in East Rutherford, N.J. “Hold on to the ball,” Beckham said when asked what he was thinking as he went to haul in the 43-yard heave from Eli Manning. 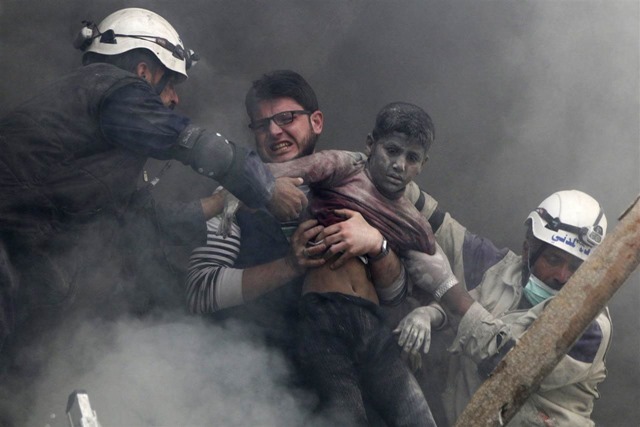 Men rescue a boy from under rubble after what activists said was explosive barrels dropped by forces loyal to Syria’s President Bashar Al-Assad in Aleppo on April 6. 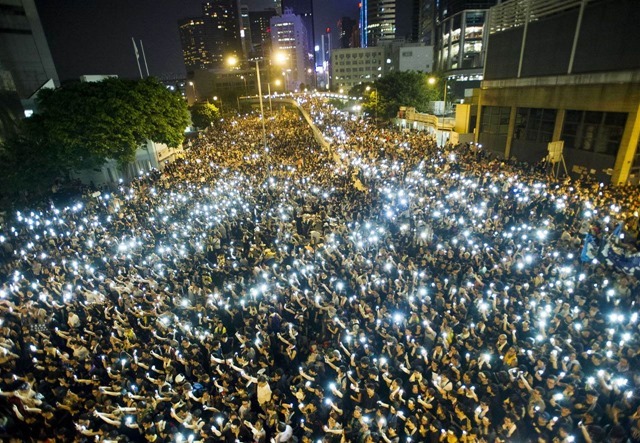 Protesters and student demonstrators hold up their cellphones in a display of solidarity outside the headquarters of the Legislative Council in Hong Kong on Sept. 29. 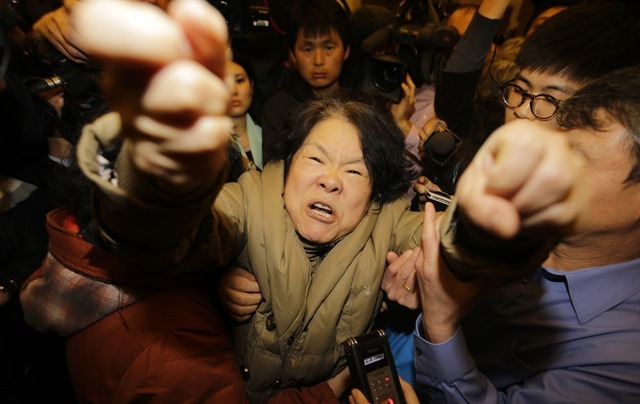 Hong Kong was plunged into the worst political crisis since its 1997 handover as pro-democracy activists took over the streets following China’s refusal to grant citizens full universal suffrage. 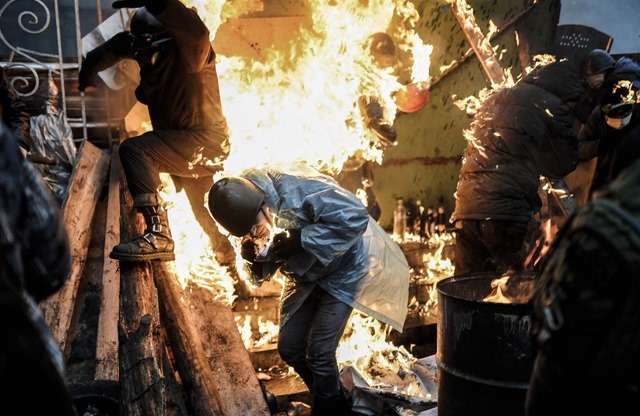 Protesters catch fire as they stand behind burning barricades during clashes with police on Feb. 20 in Kiev. 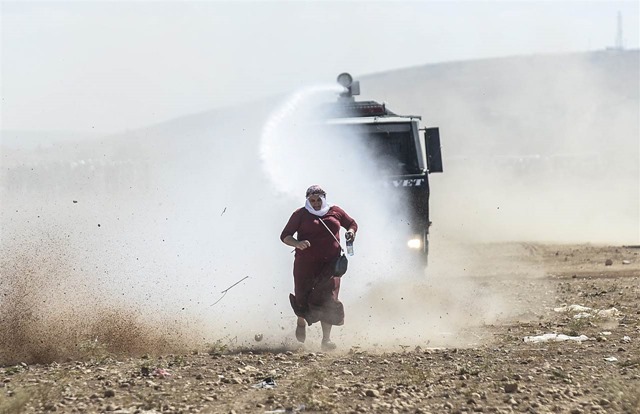 A Kurdish woman runs away from a water cannon near the Syrian border after Turkish authorities temporarily closed the border in the southeastern town of Suruc in Turkey’s Sanliurfa province on Sept. 22. Turkey said that some 130,000 people had flooded across its border from Syria as Kurdish fighters battled ISIS militants trying to capture a strategic town. 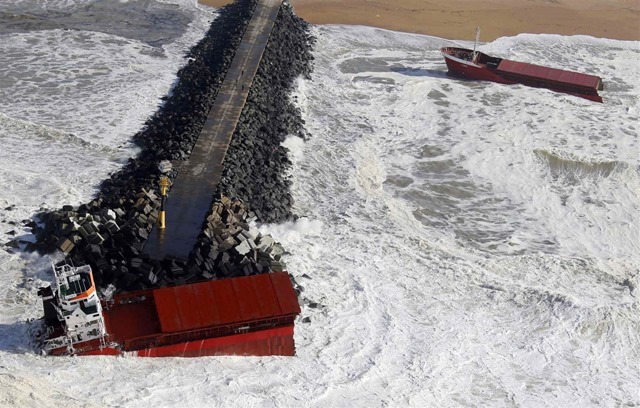 Waves break against a Spanish cargo ship that was torn in half off the beach in Anglet, France,on Feb. 5. The Spanish cargo ship carrying fertilizer was split in two after hitting a sea wall during high winds and leaked fuel into the water. 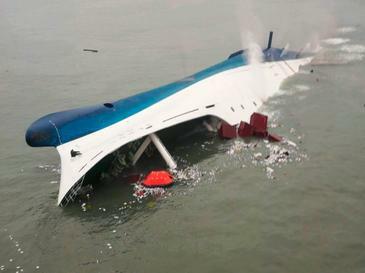 Two helicopters lifted a dozen crew members to safety, said Jean Espilondo, the mayor of Anglet. 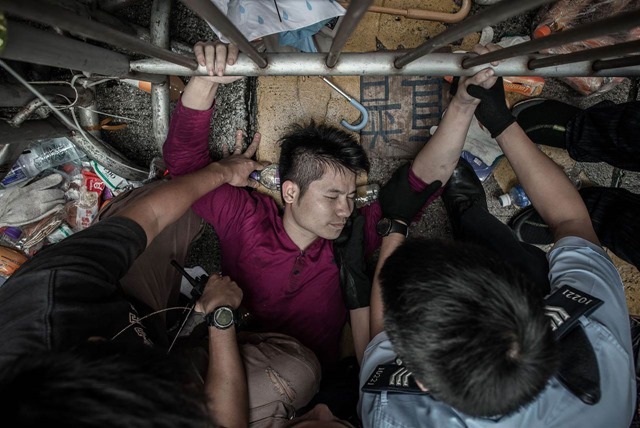 Police try to remove a man from a fence guarded by pro-democracy demonstrators in an occupied area of Hong Kong on Oct. 3. Thousands of protesters occupied Hong Kong’s busy financial and shopping districts for over 2 months. The student-led protesters rejected Beijing’s plan to screen all candidates in the first-ever elections for Hong Kong’s top leader, but failed to win significant concessions from the government. 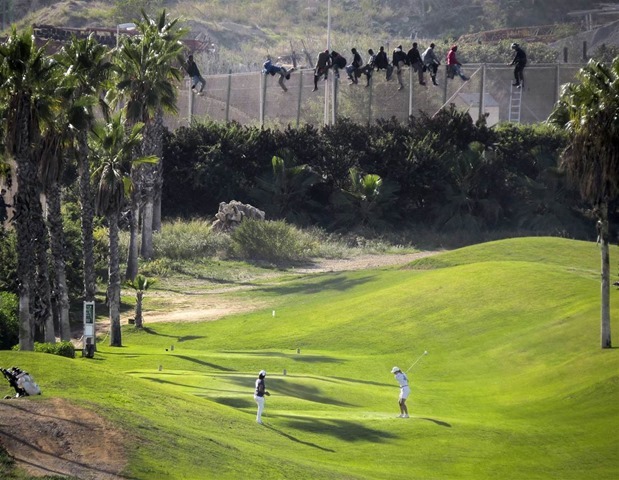 A golfer hits a tee shot as African migrants sit on a border fence during an attempt to cross from Morocco into Spain’s north African enclave of Melilla on Oct. 22. 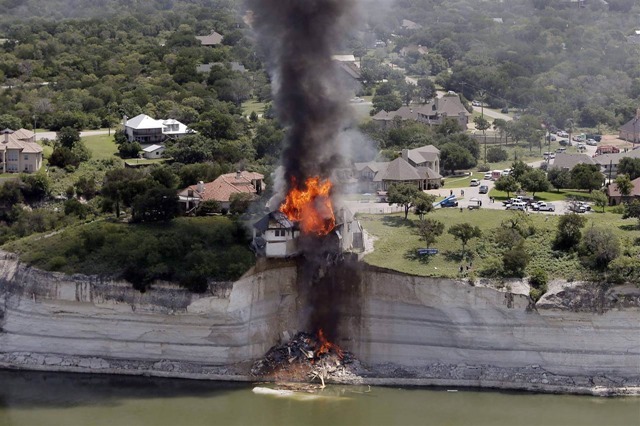 Smoke rises from a house deliberately set on fire on June 13, days after part of the ground it was resting on collapsed into Lake Whitney, Texas. According to the U.S. Army Corps of Engineers, burning was one of three options the homeowner had for removing the home from the site before it fell into the lake. 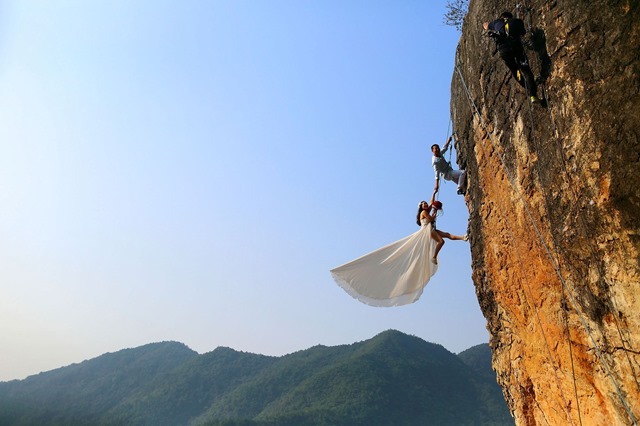 The house was evacuated two weeks earlier after cracks were discovered in the walls and chunks of the cliff and the house began falling into the lake. 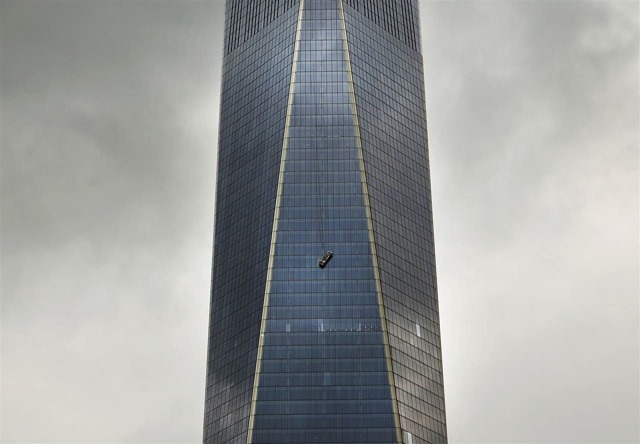 A scaffold carrying two workers is stuck 68 floors above ground at 1 World Trade Center on Nov. 12 in New York City. Two window washers were left dangling from the nation’s tallest skyscraper when a cable suddenly developed slack. 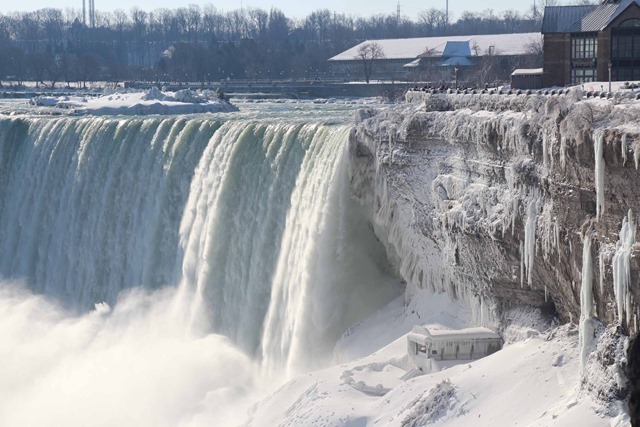 The workers held on to the teetering platform for two agonizing hours until firefighters used diamond cutters to saw through a double-layered window and pull the men to safety. 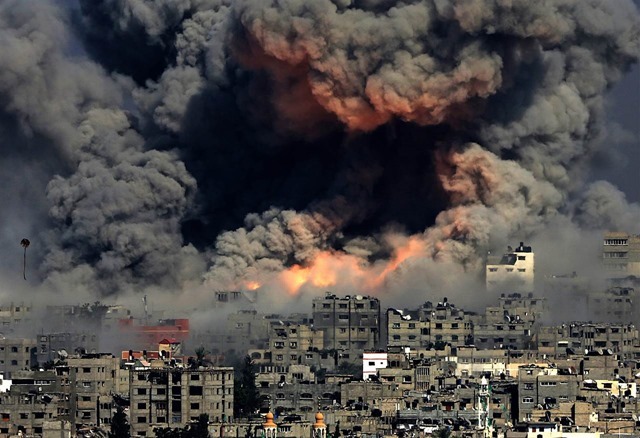 Israel pounded the Gaza Strip with airstrikes, including this one on July 29 in the Tuffah neighborhood, during a 50-day conflict with Palestinian militants from Hamas in July and August. 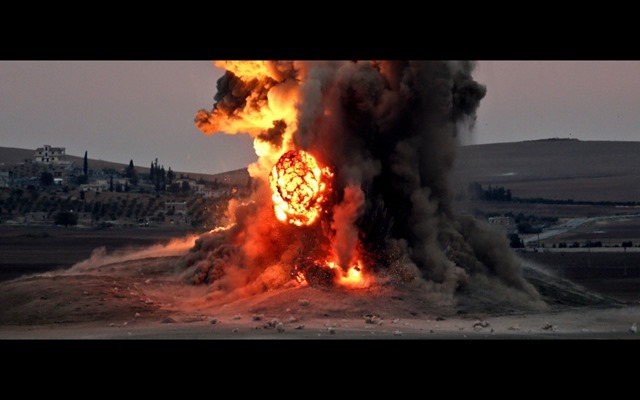 Israel sought to cripple Hamas’s ability to fire rockets and use tunnels to stage attacks. 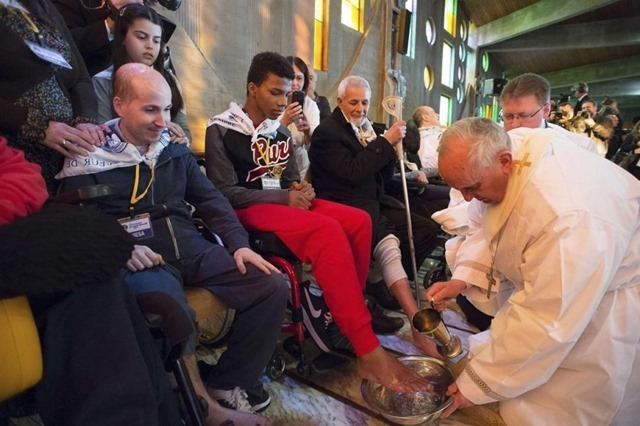 ‹ What if God was like Scrooge? 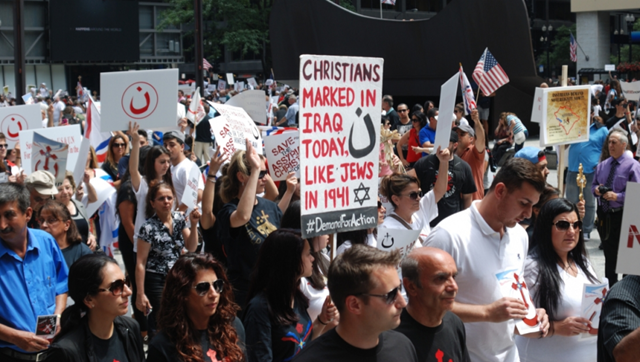 How would Christmas and Salvation be different?